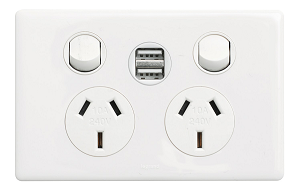 Legrand Life ED777USB2PSAWE Double GPO with 2 USB Charger outlets. Charge multiple devices at once with 2.4 Amp each USB, Fast Charge. Charges most: iPhones, iPads, iPods, iTouch, Smart Phones, Tablets etc.